I almost missed a 300ZX, could this be the one? I was getting ready to write a post about the need for a “Z Rescue” because of all of the Zs that I’ve come across in my search that are on their last leg. I was looking for a post on craigslist that I had seen of 2 300ZXs that were pretty ragged out to use some of the pictures from it. I pulled up craigslist for San Antonio, TX since that is where I thought they were and searched for “300zx”. I noticed the top post was for a “95 300zx” so I took a look at it. It was actually a Cherry Red ’94 just like I used to have. I almost missed this one because my craigslist RSS search that pulls to my Microsoft Outlook was set to look for “1994 or 1995 or 1996” but not “94 or 95 or 96”. I’ve since added those variables to the search but I feel maybe dumb luck brought me in touch with this car. 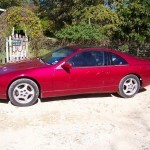 It looks to be in OK condition and he’s asking $4500 for it. It has 180,000 miles on it but if I could get it for around $4000 I would snap it up in a heartbeat. The best that I can tell from all of the photos it has been sitting out in the sun for a big part of it’s existence because a lot of the black trim and plastic is peeling or fading and the seats are cracked. I plan on doing quite a bit of work on the interior anyway so that doesn’t bother me. 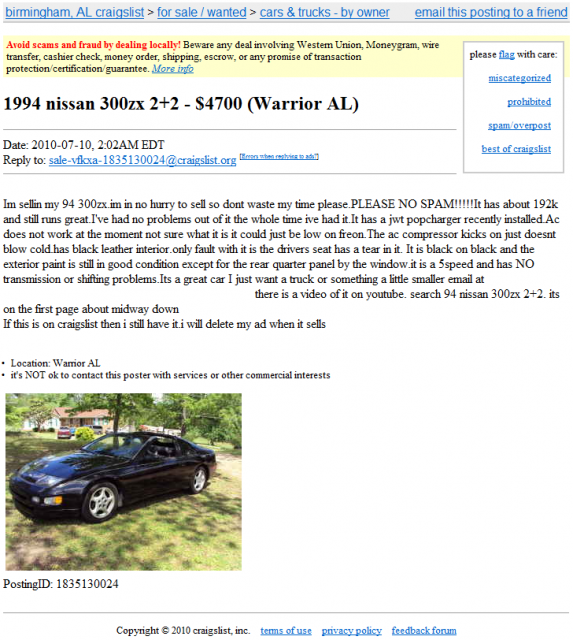 We’ll just have to see how negotiable the price is… the post says “NO LESS” than the $4500 but perhaps I’ll get lucky. I’ve also located a 1995 2+2 in Orlando, FL with this new craigslist search but I’m not sure yet if it’s an automatic or a 5 speed. I’ll post an update about it later if it looks promising. Well, I woke up this morning and checked my craigslist RSS feeds first thing and there was one of those post titles that I love to see “1994 300zx 2+2”. This one turns out to be one of the 272 (found in the Z registry) that meet all of my requirements. It’s got pretty high miles and a few paint/interior issues but I suspect that is how most of them will be. The problem I have is deciding now how picky I can be, ever since I found out there are less of these available than I had originally thought when one shows up for sale I have decisions to make… do I take a chance on this one or wait for one that is a little bit better? Well, I haven’t decided any of that yet but I’m sure I’ll do it soon. I think it’s priced a little high for the miles and condition and the owner seems in no hurry to sell it so I will definitely take that into consideration. 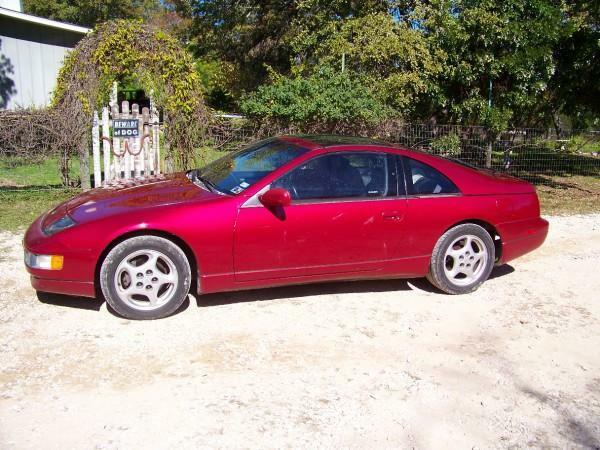 So close, but so far away – RED 300ZX 2+2… Automatic! 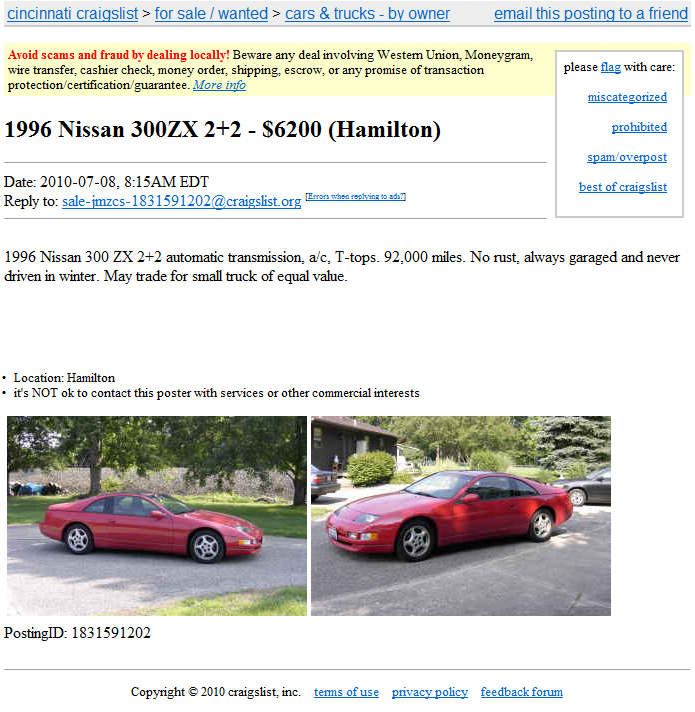 I was going through my early morning routine of looking through my craigslist RSS feeds yesterday and saw the subject “1996 Nissan 300ZX 2+2” which always gets my blood pumping. Then I clicked on the link and saw that it was a red one, which I think I’ve decided now is my preferred color. Shortly after that I read those dreaded words, dreaded by me anyway, automatic transmission… so close! Don’t get me wrong, I don’t have anything against all of those Zs and their owners with automatic transmissions out there but I currently have a Nissan Frontier Pickup with an automatic (not to mention Shelley’s car is an automatic as well) so I’ve got that part covered. I’m longing for a manual transmission so that is just another variable I will have to deal with during this search.